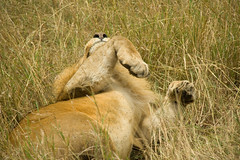 Also this day in Maasai Mara we encountered several groups of lions. Just before lunch we took a side path. There it was. 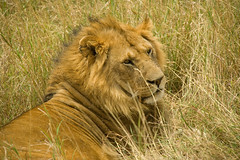 Hiding under a tree, high grass and shrub: a young male lion. Behind him another one, not well visible. If only they would get up. They got up! 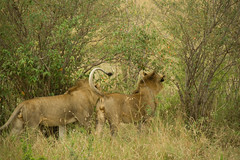 The male lions walked behind each other. Right into the shrub, down into a ditch, out of sight. This was our bad luck. 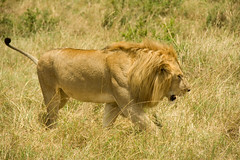 Going off the road is not alowed in Maasai Mara, for that you will have to go to Selous Game Reserve in Tanzania. 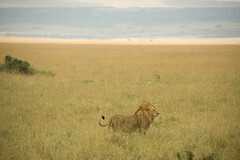 So we drove off, crossed a small bridge that overspanned the ditch the lions walked into about 200 meters to our right. Then we discovered a small track running alongside the ditch! We took the turn and luckily we saw the lions appearing out of the shrub and the ditch. They decided to cross our track and walk past our overland truck on both sides. Standing there. Lying around. Rolling over. Taking a small walk, splitting up. Walking towards the camera. Posing in the landscape. The biggest of the 2 lions lied even so close to us that you could see every hair, scratch and fly on his face. Just a couple of feet from our truck! They proved to be great shots. Great present right before a well deserved lunch after a 5 hour game drive.